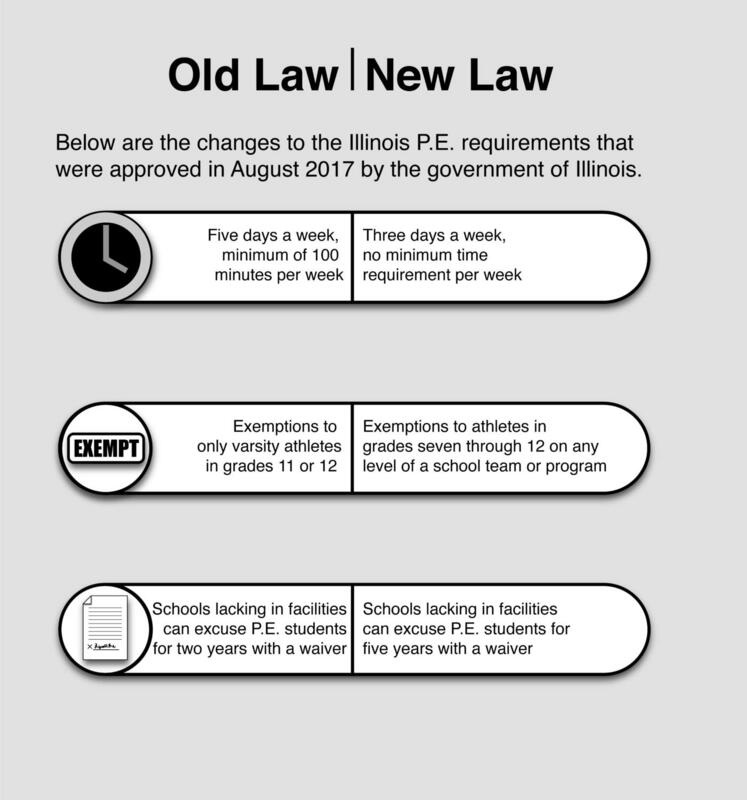 Although Illinois was the first state to require daily P.E. 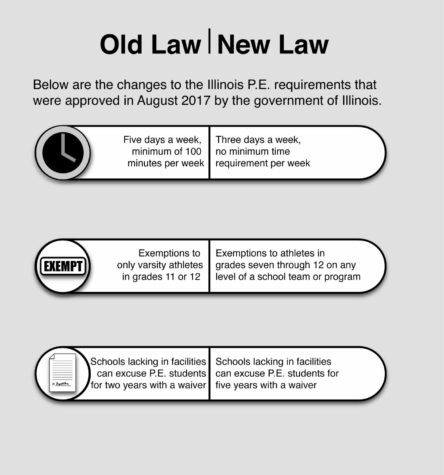 classes dating back to World War II times, the government approved changes in August 2017 that would decrease the requirements for daily physical education for students in grades K-12. “That bill was the sum of all fears for physical educators,” Brian Van Mersbergen, president of the Illinois Association for Health, Physical Education, Recreation and Dance, said. The daily P.E. requirement for Illinois schools has been reduced from five days or 100 minutes per week to a minimum of three days per week with no time requirement. Athletic exemptions have now been expanded to students in grades 7 through 12 given that they participate in any level of their school’s athletic teams or programs. School districts that lack in P.E. 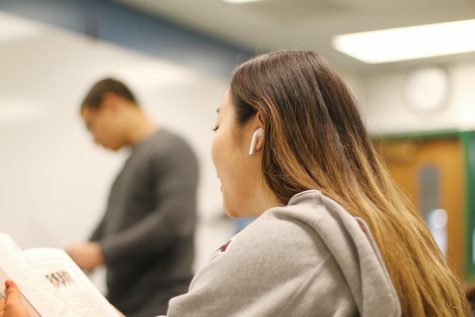 facilities can apply for a waiver and be excused, for a maximum of five years, from having students participate in the three days per week requirement. 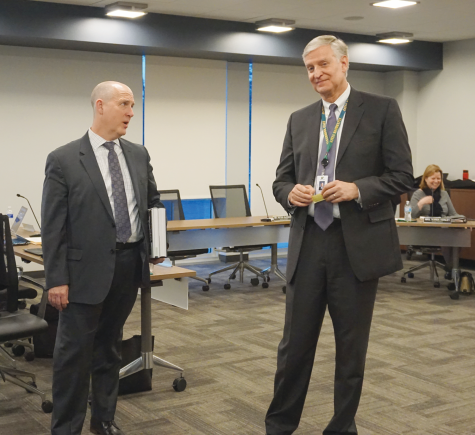 After state approval, local school boards decide how to implement the waiver. There is no limit on the amount of times these waivers can be renewed under the new law. According to Van Mersbergen, the prior legislation allowed varsity athletes in grades 11 or 12 to receive athletic exemptions, and school districts were only able to excuse students from daily P.E. classes for up to two years. School districts also could only renew this waiver a maximum of two times. Bob Pieper, instructional supervisor for physical education, driver education and health, said although the new law has been passed, the details have not been completely defined. State lawmakers are currently writing the rules and clarifying the law for school boards. Van Mersbergen said if schools were to make immediate changes to their P.E. programs, they could violate the law since it is currently “ambiguous.” He believes schools will start making changes during the fall of 2018 when the components of the law are well-defined. Under the current GBN Student-Parent Handbook, students in grades 11 or 12 on a varsity sport team can apply to be exempt from physical education for the duration of their season given that they were on varsity the year prior. Also, varsity athletes in grades 11 or 12 who need to enroll in an academic class required for graduation or admission to college can apply to waive out of physical education for the length of their academic class. The most drastic change at GBN would be the ability for winter sport athletes to waive out of physical education for the entirety of their sport, which could extend into second semester, Pieper said. Currently, athletes are only allowed to be exempt for the semester the majority of their sport is in, rather than the whole season. Jenn Mau, physical education and health teacher, said in an email that when she was the head varsity softball coach, she had denied her players the ability to waive out of gym because she wanted them to stay in physical education. Van Mersbergen said he thinks lawmakers focused on schools struggling to pay for physical education because their communities may not be able to afford it. “Where you’re going to see the reduction [in physical education] is in the population that needs the activity the most, where those kids need a break to get into the gym and get some exercise either because they don’t have the facilities or funding in the community or it’s not safe to be out,” Van Mersbergen said.